Open the clams. Remove and discard the top shells. Arrange the clams in a 3-quart shallow baking dish. Cook the bacon in a 10-inch skillet over medium-high heat until it's crisp. Remove the bacon from the skillet and drain on paper towels. Add the butter, onion and garlic powder to the hot bacon drippings and cook until the onion is tender. Stir the stuffing, cheese, parsley and cooked bacon in the skillet and mix lightly. 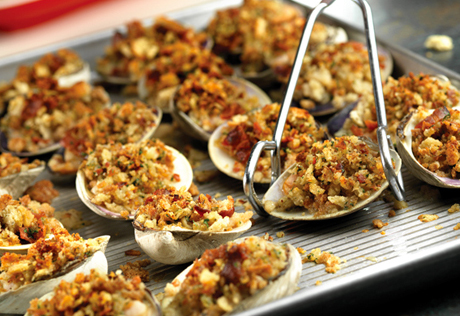 Divide the stuffing mixture evenly among the clams. Bake for 20 minutes or until the clams are cooked through.